During his senior year at Franklin & Marshall College, Will Kiefer began a weightlifting program for the Lancaster community's at-risk youth. His purpose was to contribute to his community in a meaningful way. The young men Kiefer invited into the weight room had troubled lives. They had dropped out of high school, had run-ins with the law, and, in some cases, were teenage fathers struggling to support families. Distrustful of authority and disinterested in anyone trying to help them, the young men arrived with one intention: to gain strength. So Kiefer, a 2014 graduate of F&M, trained them to use weights and listened to them. "It became pretty clear to me early on that the conversations we were having in that weight room were very important," Kiefer said. "These young men are extremely cautious about people taking advantage of them." Over time he began to gain their confidence and learn about their aspirations. As he did, an idea began to germinate. He decided weightlifting could serve as a catalyst for counseling -- because it had helped him. "It was when I found weightlifting that I found confidence and self-improvement," he says. 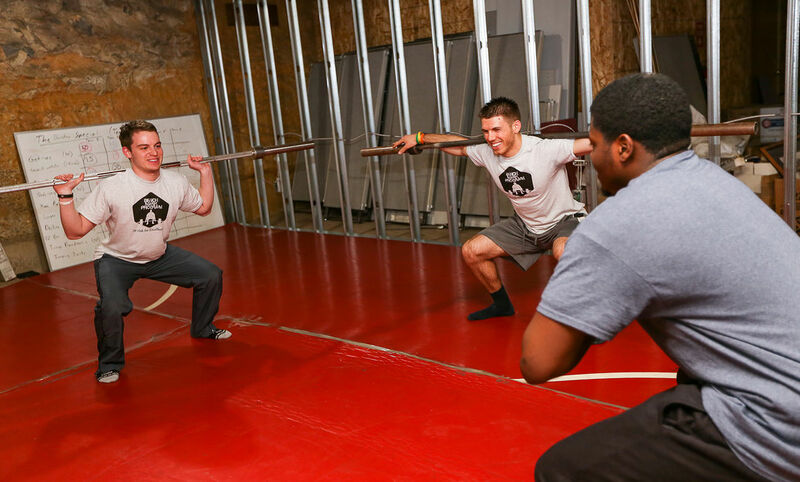 Sixteen months later, Kiefer is the founder and executive director of the Bench Mark Program, a strength-based family of mentors who use weightlifting, academic counseling, and career coaching to empower at-risk youth to achieve success. Since graduating, Kiefer and several F&M friends -- including fellow 2014 alumni Dylan Gordon and Ryan Duffy, 2015 alumnus Daniel Potter and seniors Anthony Arditi and Karla Molina -- have worked diligently to establish and launch the program. They have enrolled more than 50 students, secured part-time/full-time employment for 10 students, raised more than $20,000, announced their first two college-bound students, and opened their first gym. "I think he has a doable concept," said Andrew Appel, a retired Lancaster attorney who for 15 years was the county master of hearings, presiding over the most serious juvenile cases. Each year, Appel leads a group of F&M students to the impoverished neighborhoods of Honduras through the Central American Relief Efforts, or CARE program. During one of those trips to the steamy tropical country he met Kiefer, who impressed him with his charisma, leadership and endurance. "Honduras can be challenging, but Will rolled with every punch and remained a leader of that group," Appel said. and enrollment increased rapidly. He is a full-time employee at Bench Mark and continues to work part- time as a personal trainer. Bench Mark youth meet a few blocks from F&M at a commercial building on James Street, where Kiefer and his team of F&M alumni have turned the basement into a gym, scraping together equipment, used and old, by asking area gymnasiums to donate. One donation included dozens of broken tension bands that are pulled to strengthen muscle. "We get more use out of these broken bands from the YMCA than we do any other piece of equipment," he said. One particular evening at the gym this past winter, Kiefer worked out with 17-year-old Noel Centeno, a Manheim Township High School student who Kiefer has been counseling and who now attends Thaddeus Stevens College of Technology to study water and environmental technologies. Noel said Kiefer had worked with him on finding the right college program, figuring out how to afford it, and taking him to the school to meet instructors and administrators. "I thought about college, but I didn't know how to get into it," Noel said. "He really pushed me." Gordon, Bench Mark's chief strategy officer, cited a Pennsylvania Department of Corrections recidivism report for 2013 in which 77.9 percent of incarcerated youth reoffend within three years. He said Kiefer has a personality that appeals to the young men and believes that is one reason someone like Noel sticks with the program. "You don't meet a Will every day," Gordon said. "He's one of those positive people that rubs off on you and makes you better." Kiefer, who majored in public health and Spanish, has an ability to empathize and listen to others, according to Kirk Miller, F&M's B.F. Fackenthal Jr. Professor of Biology. "As a public health major, that's what you're motivated to do," said Miller, who teaches public health and is a Bench Mark board member. "What's the first thing a parent has to do? Listen. He's learned that lesson young." When Kiefer decided to start the program, he first contacted David Mueller, director of Lancaster County's Office of Juvenile Probation, where on any given day the office supervises about 700 kids ages 10 through 18. Mueller brought Kiefer into his courthouse office to hear what the young graduate had to say. "He explained what his vision was, and to me it was a phenomenal idea," Mueller said. "Not every kid is an athlete, but most kids can connect with the idea of fitness, and many can connect with weightlifting. What he's doing is relationship building in a positive manner." Mueller had Kiefer talk to his probation officers, who also were intrigued by Bench Mark's approach to reaching troubled youth. "It's a mentoring program with strength training and fitness as a hook," Mueller said. "With the right kid, it's a phenomenal hook because he's offering something they are interested in. These kids need the positive role model mentor -- that's what he's offering. He's doing something that I think can have tremendous results in the long run for our kids in the system."